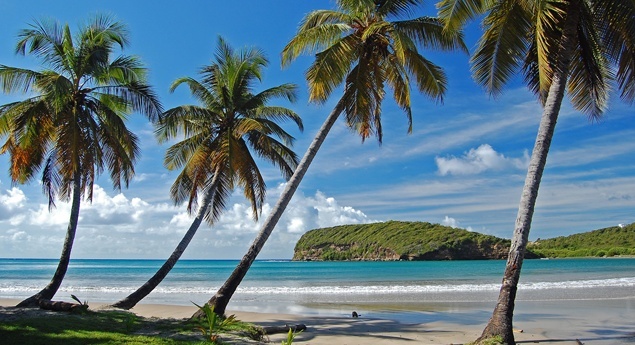 Of course if you do want to go to the beach, La Sagesse Beach is one of the most beautiful on the island. In the Caribbean, clear turquoise water and soft white sand are a dime a dozen. The sensory appeal of Grenada’s magnificent beaches is undeniable, but savvy visitors venture beyond the sun, sand, and sea. This compact island pleases with a trifecta of adventure, activities, and nature. The best part: its manageable size makes it easy to cover a lot of ground in a short time frame. Nicknamed the Spice Island, locally grown nutmeg, cloves, and cinnamon gently perfume the sea air. Island cooks utilize these aromatics in scrumptious ways, so prepare your palate for culinary magic. The tourist footprint is relatively light, so expect to be embraced by locals. Ripe for development, now is the time to explore Grenada’s unspoiled flora and fauna. Here are 10 ways to go beyond the beach in Grenada. Nestled in the heart of Grenada’s lush interior lies Grand Etang, an unblemished rainforest and wildlife sanctuary. A cobalt blue lake is its sparkling showpiece. Be on the lookout for exotic birds and playful Mona monkeys as you hike the winding trails. Grenada Adventure Tours offers thrill-seekers tubing excursions down the Balthazar River. Spin, swirl, and slide as the current carries you along. The shady vegetation and cool water are just right on a steamy day, plus, you’ll be outfitted with a life jacket, helmet, and professional guide the entire length of the trip. Belmont Estate is a locavore’s wonderland. Visitors to this 300-year-old plantation get a first-hand glimpse of how passionate Grenadians are about preserving their traditional agricultural practices. 400 acres of gardens and rolling hills produce a bounty of tropical fruits and organic vegetables. A herd of goats provide milk for the cheeses that are served in the open-air restaurant. Chocolate is produced on the estate, so you’ll commune with Willy Wonka as you observe the bean-to-bar method. River Antoine Rum Distillery is the oldest functioning water-propelled distillery in the entire Caribbean and the rum is made in much the same manner that it was 200 years ago. Watch the process and sample away. You may purchase the potent spirit in the shop, but note that much of it has such high alcohol content that it’s considered too flammable to bring home on the plane. It’s not called the spice island for nothing. An assortment of fragrant spices flourish here, but none is more globally prized than nutmeg. At theGouyave Nutmeg Processing Station, visitors join an informative tour, observing the various stages of the grading and classification process. Best of all, the tour only costs a buck. Each Friday night, the village of Gouyave is transformed into an open-air eatery that draws islanders and visitors alike to its famed Fish Friday where dozens of vendors cook just-caught seafood over open fires. Homegrown spices add gentle complexity to even ordinary dishes. Epicureans who crave the taste of the sea combined with authentic local color won’t want to miss a single bite. Everyone needs to eat to live, but Grenada appeals to those who live to eat. St. George is the bustling capital city and its market is a feast for the senses. They say that anything can grow in Grenada’s rich volcanic soil and a stroll around the market confirms this. Papaya, mango, breadfruit, and leafy green callaloo are top produce picks. The assortment of spices is outstanding and the intoxicating smells may put your taste buds into overdrive. Grenada’s complex history has seen its share of bloodshed and includes a U.S. military invasion in the 1980s. While it is extremely safe today, its strategic location means it is loaded with venerable military fortifications and visiting one of them is an essential element in understanding the island’s past. Hilltop Fort Frederick commands a panoramic view while imposing Fort George is equally stately. If the natural splendor of a coral reef isn’t enough for you, grab your snorkel mask and head to Grenada’s Underwater Sculpture Park. Sculptor Jason de Caires Taylor’s artistic gem explores the relationship between art and the environment. This manmade wonder is located in fairly shallow waters, so even novices can sneak a peak. There are many spots to refresh under the cascade of cool water. Popular waterfalls include three-tiered Concord Falls and Annandale Falls, easy to reach via paved trail. Sandals La Source is an all-inclusive resort located on stunning Pink Gin Beach. It’s a two-minute ride from the airport, so you can be on the beach within minutes of clearing customs. Besides locally inspired cuisine and top-shelf alcohol, all non-motorized water sports are included in your rate—divers will appreciate this policy, as Grenada is every bit as breathtaking below the water as above it. Experts consider it one of the top wreck dive sites in the world with over 20 shipwrecks. Grenadians know how to party, or “lime” in local speak so try and plan your visit to coincide with one of the island’s numerous festivals. The premier event is Carnival aka Spicemas, held each August. In the spring, Chocolate Fest pays homage to this country’s favorite confection. If you’re lucky enough to visit in winter, get better acquainted with this country’s seafaring traditions during the Grenada Sailing Festival. This article was written by Allison Tibaldi, a native New Yorker who has lived in Rome, Tuscany, Melbourne, Toronto, and Los Angeles. She is fluent in Italian and Spanish and laughably adequate in French. When she’s not traveling, she’s scouring NYC for delectable eats. As a freelance travel writer, she focuses on family, culinary, and car-free travel. She’s also a senior travel writer at offMetro.com.